According to thousands of weight losers, the 10 Best Exercises for Weight Loss include swimming. The best exercises for weight loss, a healthy diet plan and quick weight loss tips were frequent and popular topics at my clinics, seminars and workshops. Men, women, girls, boys, young and old. City, country, rich, poor and in-between. Big, bigger and biggest. Here’s what the overweight told me was the most practical, doable and least intrusive, best exercises for weight loss. Even though high intensity activity burns significantly more calories, compared to low and moderate activities, my clients overwhelmingly chose low to moderate intensity activities. They chose low impact because there is little or no physical discomfort. THEY PICKED IT BECAUSE THEY COULD DO IT. Best Exercises For Losing Weight :: How to evaluate the best exercise plan for YOU. More Best Weight Loss Exercise Programs :: Find more ways to painlessly add exercise into your day and build fat-gobbling muscle. 1. Walking -- Moderate to brisk pace. This is what I recommend in my book because an overwhelming percentage of successful weight losers told me it worked for them. I have seen weight loss miracles in my career. Most involved the fine art of frequent, consistent brisk walks. Begin slowly and gradually work up to a brisk pace. Begin by walking 20 minutes and increase to 45 or 60 minutes. Do this five days a week. Walk daily. Walking strengthens and tones almost every muscle in the body. It gets you in the best shape for the effort expended. It's not hard or difficult and pays instant rewards. Most of my clients agreed walking was one of the most practical, best exercises for weight loss because THEY DID IT. Here’s a couple of real time examples of the results you can anticipate from walking. Keep in mind the more you weigh the more calories you burn because you expend more energy to move additional weight. Yearly weight loss: 22 lbs. …Walk only 30 minutes, five days per week and lose 14 pounds in a year. Yearly weight loss: 28 lbs. …Walk only 30 minutes, five days per week and lose 18 pounds in a year. In the above examples only walking was used to lose weight. A change in eating behavior was not necessary. However, this type of walking has so many benefits I urge you to continue walking after you reach your ideal weight. Combine walking with a healthy diet plan and you have the formula for lasting weight loss success. Walk correctly for maximum calorie burning efficiency. If your breathing is light, pick up the pace and walk more briskly. If you’re gulping air or can’t catch your breath, slow the pace down. Pace, frequency and consistency are most important. A mind boggling 74% of the people I interviewed favored walking over any other activity for weight loss. Here’s what the remainder said was their preferred exercises for losing weight, in order of stated preference. 2. General Aerobic Workout - By far and away the second most popular weight loss activity. And why not? Most everyone can participate. If I had a dollar for every client that told me they owned a copy of Richard Simmons “Sweatin’ to the Oldies” I could pay off the national debt. 3. Swimming - This is misleading. Many people who swim do so because they are too large to participate in other activities including walking. Swimming was a last resort activity for these folks. 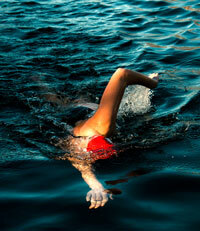 However, many people swore that swimming was the most revitalizing exercise for losing weight. 4. Bicycling (moderate) - Another misleading category because the folks who ride bikes rarely had more than 30 pounds to lose. People who chose bike riding were the healthiest of my clients. This group enjoyed their activity more than any other group. I’m convinced, based on what I was told, bike riding can become a full-on habituation. 5. Golf - I call golf the pretend physical activity. You need more than one hour of golf per week. This crowd did not have much weight to lose and as a group did not stay with it as viable exercise even though they continued to play infrequently. 6. Bowling - These folks are fanatics. They love their activity. However the beer and pizza cancelled much of the hard won gains. A fun way to burn calories if you can participate frequently and lay off the indulgences. Several of my clients admitted to bowling three, or more, times per week with a reasonable amount of success. It surprised me. 7. Pilates - This should be higher on the list considering its benefits. Unfortunately most people consider Pilates as mere stretching exercises when it’s so much more. 8. Jogging - Many people consider this to be one of the best exercises for weight loss. Unfortunately not everyone is physically capable of participating which is why jogging is so far down the list. When overweight people take up jogging they complain in the beginning and transform into jogging addicts. It’s amazing. 9. Hiking - These folks lost weight. Many hiked on golf courses. Most sought out park trails. Hiking is high end, calorie burning walking. Up and down hills. Crawling over downed trees and jumping across streams. Hiking is walking on steroids. If more people understood the super quality cardio benefits from hiking, it would be more popular. Unlike mere walking, hiking can wear you out. 10. Other exercises for losing weight reported by significant numbers of my clients included - dancing, fishing, frisbee, health club machinery exercise (accompanied with complaints of expense), water aerobics and handball. You burn calories even while sleeping, sitting in front of the television, combing your hair and brushing your teeth. Even your thoughts generate calorie burn off. Include some of the following activities into your healthy diet plan and daily schedule. The cumulative effect will pay handsome weight loss rewards. Calories burned are for a 190 pound person participating in the activity for one hour. Remember, the more you weigh, the more calories you burn. Any credible healthy diet plan includes efficient exercises for losing weight. Choose one or two and stay with it. Frequency and consistency are more important than intensity. Most importantly, have fun! Another secret to burning maximum calories is constant movement. Pacing, fidgeting, tapping your foot, stretch, yawn or twiddle your thumbs. This isn’t exercise per se, but constant movement, or planned fidgeting, can burn up to an additional 300 calories per day. Planned fidgeting can be a valuable component of weight loss exercise programs. and leave 10 Best Exercises for Weight Loss. Go to HOME PAGE for more about a healthy diet plan.